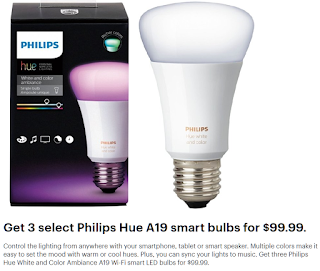 3 Pack Philips Hue White & Color Ambiance A19 Smart LED Bulbs $99.99 (Reg $149.99) + Free Shipping. Smart bulbs work with Amazon Alexa, Apple HomeKit, Google Assistant, Hue, Nest, SmartThings, Wink. The soft flattering colors set a tone, and you can sync your lights depending on your activities through the corresponding app. This Philips hue white and color ambiance bulb offers 16 million choices in both warm and cool for versatility.